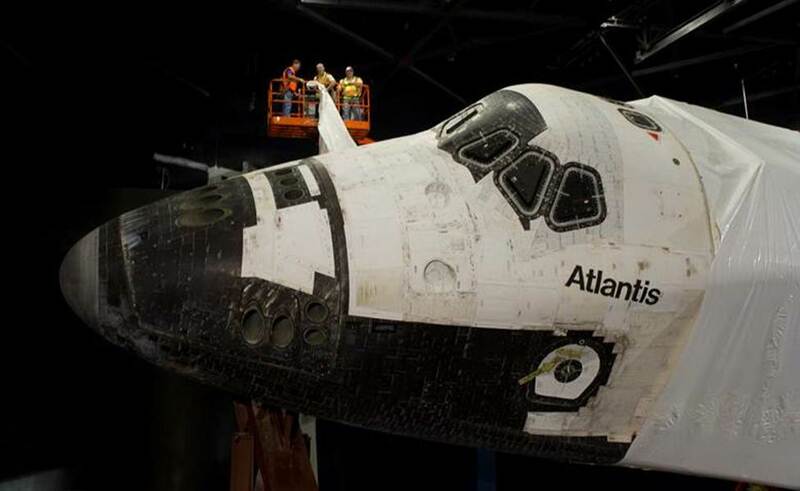 NASA’s Kennedy Space Center Visitor Complex today began the two-day process of unwrapping the Atlantis orbiter from the protective shrink wrap that has encased the priceless artifact during construction of the $100 million Space Shuttle Atlantis attraction, set to open June 29. Atlantis has been enclosed in 16,000 square feet of protective plastic shrink wrap since its Nov. 2 move from Kennedy Space Center to the Visitor Complex and into the 90,000-square-foot attraction, which has been under construction for 15 months. In a planned approach today, specialists first cut the shrink wrap into sections and then lifted it away in a dramatic reveal of much of Atlantis, including the forward fuselage. The unwrapping process is expected to be completed on Friday. Atlantis is raised 30 feet off the ground and rotated at a 43.21 angle as if orbiting Earth. When the attraction opens June 29, guests will have an up-close, 360-degree view of Atlantis from several different levels — the wear and tear of its 33 missions apparent on its protective external tiles. Next week, Atlantis will be inspected and prepared for display as the final phase of work on the attraction continues. Beginning in May, the orbiter’s payload bay doors will be opened, a meticulous three-week process, allowing guests to see inside the space shuttle’s payload bay as never before. Meanwhile, assembly continues — with the aid of a 240-foot-tall crane — on two full-size, high-fidelity solid rocket boosters (SRBs), which, when vertically mated with a high-fidelity model of the external tank (ET), will form a dramatic, 184-foot-tall gateway under which visitors will pass to enter the Space Shuttle Atlantis attraction. This entry was posted on April 26, 2013 by News in Donna Balancia Editorial, Donna Balancia promotions, Space Exploration, Space Travel and tagged Angry Birds, Astronauts in Florida, Donna Balancia Publicist, Florida, Florida Attractions, Florida Vacation, NASA, Space Shuttle Atlantis, VisitFlorida.